to speak in Santa Fe and Las Vegas. SANTA FE, NEW MEXICO — A foundation dedicated to bringing world class arts to the National Parks is bringing two artists to one of northern New Mexico’s premier cultural and historical sites, Fort Union National Monument. Sculptor and Installation Artist Marlene Alt spent October at the Monument near Las Vegas, and used the time and aura of the place to create new work. She is ready to share her insights and sneak peek some new work to the public. Also, Photographer Steven Martin, November’s Artist-in-Residence at Fort Union will be on hand in Santa Fe to speak about his plans for his time at the monument. The National Parks Arts Foundation, (NPAF) a 501(c)3 non-profit, working with the National Park Service at Fort Union National Monument provided the inaugural Fort Union National Monument Artist-in-Residence program. The Artists-in-Residence will present their public programs at two locations: one in Santa Fe, and the other in Las Vegas. Marlene Alt will premiere excerpts from new work and share experiences during her residency, and speak about working at this culturally rich Monument and also about ongoing past work. The first of these events will be held at the Georgia O’Keeffe Museum Education Annex, located at 123 Grant Ave. Santa Fe, NM 87501 on October 29th, 2015 at 6:30 PM. Both Alt and Martin will be on hand to discuss their work and artistic process. The second event will be a public presentation by Marlene Alt at Gallery 140, located at 140 Bridge Street, Las Vegas, NM 87701 on October 30th, 2015 from 6-8 PM. Steven Martin will be Fort Union’s Artist-in-Residence in November, and will present toward the end of the month. 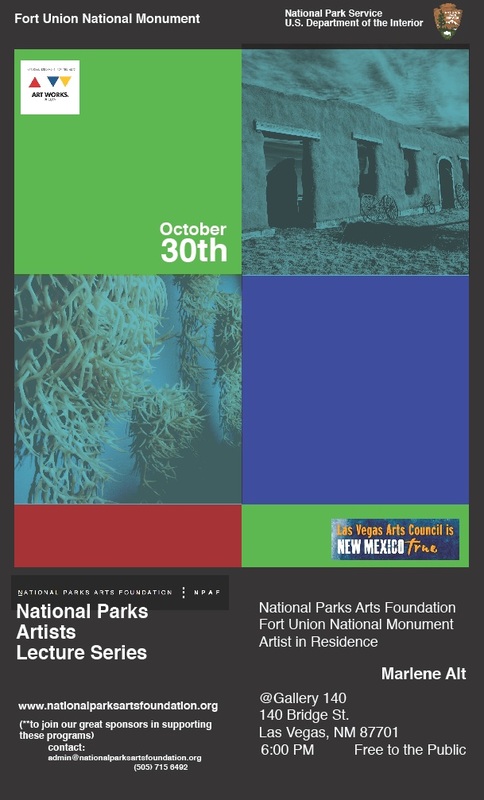 Also attending will be the President of the National Parks Arts Foundation, Tanya Ortega, Emmy award-winning Filmmaker and Activist Ylonda Viola, the Fort Union National Monument Artist-in-Residence, Marlene Alt. Some of the National Parks Arts Foundation sponsors are: The Georgia O’Keeffe Museum, the Las Vegas Arts Council, a grant from the National Endowment for the Arts, and the National Parks Arts Foundation. 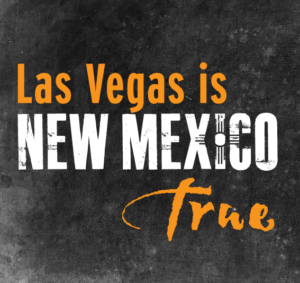 The NPAF is expanding to more parks in New Mexico! The state is both a natural wonderland and blessed with more than its share of gifted artists. It only makes sense to bring these further opportunities for art experience to the public. The Foundation is always looking for donations from Santa Fe, Las Vegas and from generous donors all over New Mexico to fund these and other arts programs at National Parks. Please visit www.nationalparksartsfoundation.org to see how you can help. October’s resident, Marlene Alt, based in Ashland, Oregon, is originally from North Dakota. Her work is focused on how the often melancholy material traces of everyday culture resonate and awaken in different constructed contexts that are symbolic landscapes. Alt’s fascination with the rich interaction between inner landscape of culture and history and the outer landscape of natural phenomena makes her a fitting choice for the mysterious character of the ruins at Fort Union. Marlene Alt’s work has been shown in solo and group exhibitions in museums, university art galleries, and non-profit spaces, such as the San Jose Museum of Art, the Nevada Museum of Art, the Yellowstone Art Museum, the Portland Art Museum, Northern Arizona University Museum, the Ohio University Art Gallery, A+D Gallery, Columbia College, Chicago, and the Urban Institute for Contemporary Arts, Grand Rapids, MI.